Join us on Thursday, December 16 at 7:30 for The Art of David Gista. David Gista is an internationally acclaimed French artist and the owner of The Art School and Gallery G in Glencoe. Many of his paintings feature libraries and personal memories. Franz Kafka, Jorge Luis Borges and other authors influence his work, which is both mysterious and poetic. Enjoy Gista's lively presentation and view his work! The library will close at 4:00 and will reopen for concert seating at 4:30. Seating is first come, first served and the concert is open to all. As always, we are grateful to the Friends of the Glencoe Public Library for sponsoring this wonderful event! On Thursday December 9th at 7:00, art historian and professor Dr. Michelle Paluch-Mishur returns to the Glencoe Library with another one of her popular and informative art programs. This November the famous “Chagall Windows” returned to the galleries of The Art Institute of Chicago after a five-year absence. To mark the occasion, this program examines the career of Marc Chagall, one of the world's most beloved artists. 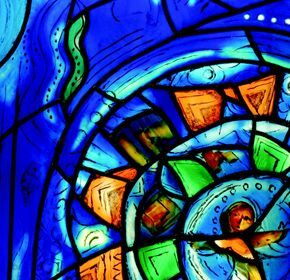 Dr. Paluch-Mishur will discuss Chagall’s distinctive style and his major themes and will present many important paintings and projects Chagall completed including another Chicago favorite -- the Four Seasons Mosaic. Was Christopher McCandless crazy, cool, or a victim of bad luck? On December 6 at 7:00 you can discuss it at this special book group for young adults with disabilities who are out of high school and living in New Trier Township. The discussion will be led by Brian Leverenz, community services administrator of New Trier Township, with the assistance of Andy Millman of Glencoe Youth Services. It's presented by New Trier Township, Glencoe Youth Services, and the Glencoe Public Library.